Catching up with the current global trend, let’s talk about the Drupal framework which evolution during the last 10 years significantly changed the lives of many people, including its creators Dries Buytaert and Hans Snijder. What originally started as a simple message board platform created by Dries Buytaert and committed by him on December 29, 2000, was then released as Drupal 1.0.0 on January 15, 2001, with GPL license attached to it. This decision set the main course of platform’s evolution as an open-source product designed for everyone’s good. The pivotal moment came with Howard Dean’s primary campaign for the 2004 U.S. presidential election when a web team built decentralized "DeanSpace" network using Drupal platform. So, starting from 2004 the world saw a significant boost of Drupal Webform usage that was introduced in Drupal 4. But only over the last #10years Drupal became a free leading open-source CMS, not only surviving the major transformations in the IT industry but also giving inspiration to creators of other big platforms like WordPress, Vignette, etc. When Dries coded the simplistic Drupal 1 in his dorm room he hardly anticipated that years later there would be Drupal 8 with one of the most powerful packages of modules. Not to mention the Drupal API toolset that developers all around the globe call ‘the best possible solution’. It truly became a ten years open-source revolution that transformed website development industry into what we see nowadays. So, here is #10YearsChallenge from sixth ‘drop’ to the eighth. The reason for such enormous success lies in the concept of Drupal’s community contributions and the tendency for constant reinvention and evolution. Like famous modules and “hooks” that are very popular these days in many other platforms – Drupal developers introduced them during the pretty early period of Drupal’s growth. And as the Drupal community continues to grow day by day, more and more developers choose an option to create a Drupal 8 module to make their own contributions to the common cause. Drupal lives, develops and grows as a tight family of dedicated contributors where each member plays a crucial part in platform’s growth. The community of developers and users actively support the platform with new updates and functionality improvements. Everything we see in the current 8 version of Drupal modules is an achievement of the whole ecosystem. So, ten years later after the Drupal 6 release, we have this simplistic, flexible and elegant web application framework with a huge community base that provides millions of users with robust Drupal 8 modules for superior content management in any website development project. In addition to all achievements, thousands of big corporations, famous companies and even governments use the brilliant Drupal e-commerce package with its essential modules. And this CMS keeps winning prestigious IT awards year after year. Drupal 8 – What Lies Beyond? Without a doubt, it’s been a heck of a ride with ups and downs, but we all know that they’ve got things right in 8th version of leading content-management system (CMS). The latest release on January 17, 2019, presented users all over the world with newly upgraded Drupal 8.6.7, which proves that striving for continuous evolution always pays off. These days, worldwide-known users of Drupal CMS include such giants as NASA, Twitter, official websites for The City of London, Australian Government and New York State, Tesla, Verizon, NBC Channel, Taboola, Entertainment Weekly, eBay, Harvard and Stanford Universities. And even the famous Emmy Awards ceremony and Lady Gaga built their platforms on Drupal. Hence, the continued adoption of their tools is self-evident. 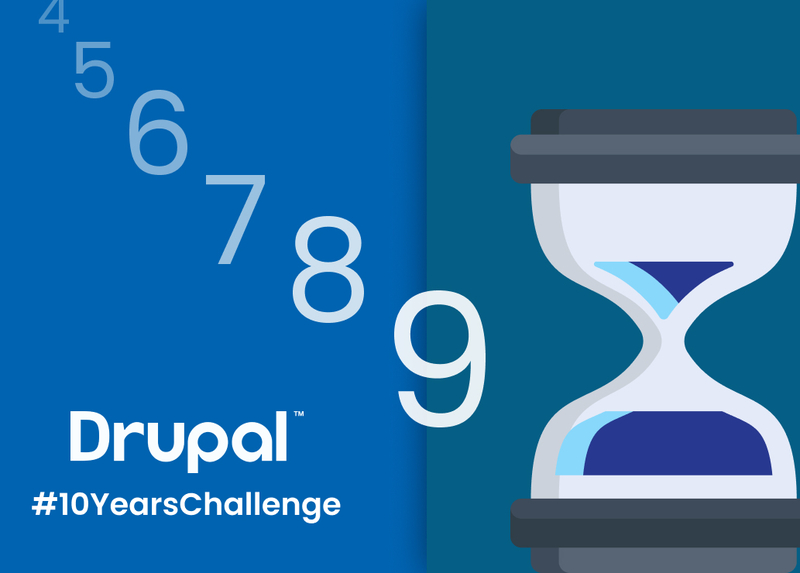 Which means that we’re standing on the verge of next #10YearsChallenge for Drupal evolution.